The River Taw rises on Dartmoor and flows to the estuary at Barnstaple. One of its tributaries is the Little Dart which runs through the small hilltop town of Chulmleigh. Close by, at Eggesford, there is a railway stop on the Tarka Line which runs from Exeter to Barnstaple. 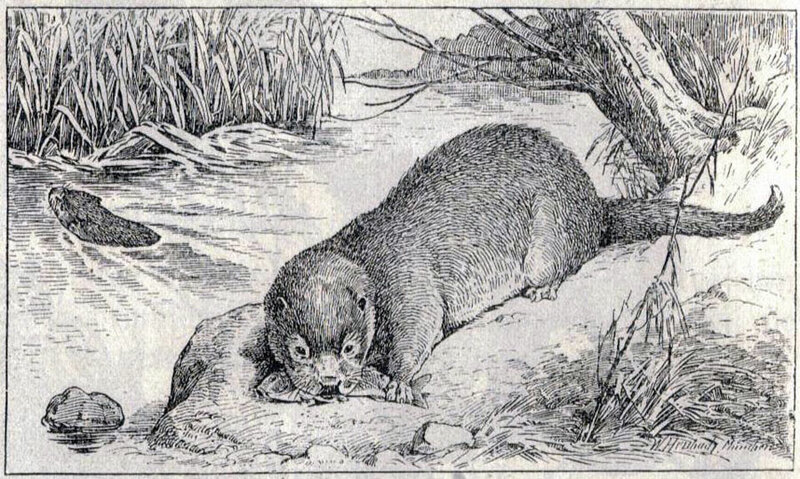 In this neck of the woods, everything has a name linked to Henry Williamson’s famous character – Tarka the Otter. The local link of the Tarka Trail is part of the national long distance footpath network and runs through Little Dart Ridge, Valley Walk and Two Moors Way. Some of the woodland around Chulmleigh and in nearby Eggesford Forest is quite ancient and there are plenty of lovely walks in these places. Plants such as the wood anemone, wood sorrel and spurge can be found in these habitats. In Heywood Wood, which is part of the forest, are earth ramparts of a motte and bailey castle from the time of the Normans. There are also some interesting and unusual trees such as a Chile Pine and a Western Red Cedar. Chulmleigh area has one of the greatest concentrations of species rich grassland in the world. It is known as the Culm grasslands and is particularly important for the continued survival of the curlew and the marsh fritillery butterfly. The old hedges and copses, dating back to Saxon times, are home to the dormouse and the rare Brown Hairstreak butterfly. The barn owl can also be found here as can the largest population of wild otters in England. Chulmleigh Parish has been designated as both an Area of Rural Tranquillity and an Area of Great Landscape Value. The area has long been settled and it is known that the Celts cleared trees around Chulmleigh to make their sacred clearings known as nymets. The name Nymet or Nympton is still common in the area. The Saxons continued the clearing of woods and built banks to mark the boundaries of different holdings. In 815 AD Ceolmund, a Saxon theign, arrived on the banks of the River Taw. From here he travelled north until he found a large open area on top of a hill. He immediately recognised the advantages of this location with its staggering views, and also recognised that there would be good hunting of deer and wild boar in the nearby forests of Eggesford. He named the Ceolmund’s Leigh which ultimately became Chulmleigh. Chulmleigh Fair started 750 years ago and the town was a bustling trading centre for centuries. It was only the development of the turnpike road and the advent of the railways in the mid 19th century that moved many of the market activities to other venues. There are some very old buildings of cob and thatch and others built of local Devon stone. Egypt Cottage and Lower Dodyard are some of the oldest buildings in the parish. The centre of Chulmleigh is a conservation area with many listed buildings. Above many doors are carved heads and keystones’ of which the axe blade variety seems to be a local speciality. The Church of St Mary Magdalene was founded during the 14th century and is built on a grand scale for a small place. This is probably due to Chulmleigh’s former prosperity from the wool industry and the relative importance of the town at the time the church was built. The inside of the church is worth a visit to see the deeply carved, painted bosses of the wagon-roof. The impressive rood screen stretches the full width of the church.